Why do we or should we floss? How is dental floss made? If you went outside to wash you car or truck, would you wash the bodywork but not the wheels? When you shower, would you wash the top half your body, but not the bottom half? I am going to presume that the answer is NO, to these 2 questions. Why is it then, when it comes to brushing our teeth, so many of the population are failing to clean up to 40% of their tooth surfaces? That 40% is the area that flossing cleans. According to statistics, 18.5% of Americans do not floss their teeth at all, with a further 31% flossing less than once a day. Just 50.5% actually floss daily. Just because you cannot see the side of your teeth like you can the front, it is within these gaps between teeth that bacteria and food particles can build up and turn into a real threat to your teeth and gums. Flossing or interdental cleaning as it is otherwise known, is the procedure that reaches these surfaces of the tooth, that regular brushing alone does not. Flossing isn’t glamorous and it certainly is more tricky for most people than tooth brushing. It can take time to do it right, but with practice you can get quicker. A common complaint is that it hurts and the gums bleed. Well guess what? They are bleeding and hurt because you are not flossing. Is it any surprise that a survey should find that about 50% of the population are not flossing and then another by the Centres for Disease Control and Prevention should find that 47.2% of the population have gum disease! In 2011 a review of clinical studies found that some of the data and links between flossing and plaque removal were weak and recent headlines in the media have questioned the evidence and need to floss. But despite this, flossing remains a key recommendation of institutions like the American Dental Association in the USA and the National Health Service (NHS) within the United Kingdom. They and many dental professionals around the world will confirm that interdental cleaning is essential as part of a good oral hygiene routine. Overall, the weak evidence tends to show that flossing and toothbrushing seems to be better than toothbrushing alone. The answer to this question is that there isn’t one best floss. There are lots of similar products and what I like will be different to you. Not to mention, some products are better suited to one person than another. If you have large gaps in your teeth, interdental brushes are likely to be more effective than floss. Whereas those with very small or no gaps in teeth will wan to go with dental floss. It is about finding the one that is right for you. Although there isn’t that one best option, there are those highly rated and popular choices. Throughout this article I explain the factors you need to consider to help make a decision, but, for those short of time, these are some of what I consider to be the best better options. Interdental cleaning is the use of a specialised appliance – e.g. floss, toothpick, or TePe brush – to clean the gaps between the teeth. The act of interdental cleaning aims to clean the side of teeth, including that hidden under the gumline to remove plaque and bacteria, along with food particles that build up on these surfaces. Flossing is a type of interdental cleaning. Flossing is the act of cleaning between the teeth using a type of tape or string, known as floss. Floss is one of the most common and perhaps more traditional products used to clean these spaces, and the sides of the teeth. Alternative products can be used for interdental cleaning, such as interdental brushes. Both products have a place in the market and many dentists will recommend the use of both. Even though advances in science, clinical testing and our understanding of oral health has improved over the decades, even the best electric toothbrushes, including those with so called ‘floss action’ brush heads are limited in how much of the tooth surface they can actually clean. Brushing the teeth alone leaves up to 40% of the tooth surfaces untouched. You can argue it is about having the right tool for the job and this is where the floss comes in, it is so perfectly suited to cleaning those often tight spaces between teeth. When the bacteria that forms into plaque is left untouched it can build up, creating a foundation and perfect environment for even more plaque to stick to. Over a relatively short space of time, it can begin to cause quite serious issues. Most common is the irritation of gum tissues and the onset of gingivitis, the earliest stage of gum disease and decay. Some of the key reasons that you should floss are as follows. It reaches and scrapes clean up to 40% of the tooth surface not reached with regular brushing. 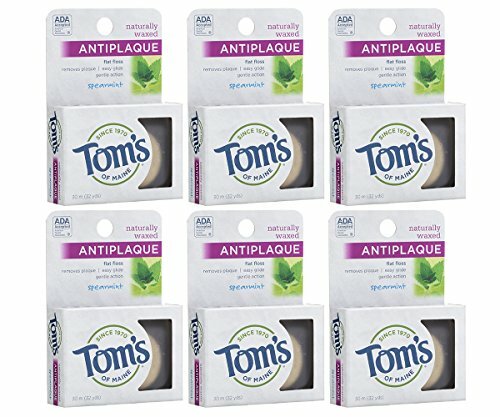 It dislodges and removes plaque. It dislodges and removes other nasty bacteria. It dislodges and removes food debris stuck between teeth. Reaches under the gumline where bacteria can become trapped. Can help prevent tartar build up. Can help reduce the chances of gum disease. Makes your mouth feel cleaner and fresher. Here are some of the most common excuses our in-house dentist, Gemma Wheeler, hears when asking why patients don’t floss. Whilst some of these excuses are indeed valid, a good dentist or hygienist will take the time to explain what you can do to avoid them. Continue reading to understand how by not flossing you might in fact be causing the very issues that make flossing unappealing. Dental floss is a dental appliance designed to be used to clean the spaces in between teeth. Made up of multiple strands of fibre woven or wrapped together, it is either a thin, but rounded in its design, looking very much like a piece of string. Or it has a larger, flatter surface area and is often waxed for a very smooth movement across the edges of the teeth. This flatter style of floss is typically known as dental tape, which is a newer introduction that is generally more popular. As the floss passes over the edge of the tooth surface, the resistance essentially scrapes or rubs off any bacteria that it comes into contact with. The very thin profile means that it will glide under the edge of the gum, into the gingival margin, an area where plaque is known to build up. Dental floss dates back to later than you might think. What we know of the history of dental floss is not as detailed as the toothbrush and there hasn’t been an exact dating of when dental floss was first used. Indications are, based on the grooves found in the mouths of prehistoric humans were caused by toothpicks used during there prehistoric times. It is thought that horsehair and twigs were used as floss. This is not unsurprising when early toothbrushes made use of similar components. More recent records show that Dr Levi Spear Parmly introduced the idea of using silk that had been waxed, as a floss in 1815. It was in 1882 that America company Codman and Shurtleff mass produced unwaxed, silk floss. By 1898 Johnson & Johnson were granted the first patent for dental floss. It used the same silk material that doctors used for silk stitches. Come the outbreak of World War II in the 1940’s, the changing economies made silk expensive and it was necessary to find a cheaper solution. Enter nylon, that brought with it the benefit of being stronger too. During this time, whilst tooth brushing was important, flossing had certainly not been widely adopted (heck, adoption still isn’t that great today), but it was Dr Charles Bass who made it a part of daily healthcare routines. Interdental brushes, or as you might know them TePe brushes (a brand of interdental cleaners), were introduced in the 1980’s and increased in popularity ever since. With modern engineering and innovation tools have become even more specialised with variations of floss and brushes, many of which are explained within this article. However, the good old fashioned floss still remains and is core to oral healthcare routines around the world. Floss begins life as plastic pellets and though a series of processed is transformed into the nylon floss millions use daily. The pellets are melted together to form long strings, that are then stretched to increase the strength and length of the molecules within. After a wash, to remove any dirt, the nylon is coated with a wax and covered with a peppermint powder (or other flavour) to give the floss that minty fresh taste that so many of us associate with dental health products. Naturally, most of this is all done automatically by machines. Large spools containing many metres of floss are produced by the factories each day. The floss is fed onto smaller spools and cut to a predetermined length. These are the individual spools of floss you and I buy. Fitted into the manufacturers choice of packaging, they are boxed up and shipped out to be sold on shop shelves. The following video shows how Oral-B produce their Satin Floss. When it comes to floss, you first need to be aware of the structure. Made from stands of filaments or fibre there are two types, known as ‘monofilament’ and ‘multifilament’ floss. Nylon is the most common component of floss and in the production process multiple strands can be woven together to create ‘multifilament floss’. This creates a strong flat strand that can be comfortable for most to use. There is also ‘monofilament’ floss that is made from just one stand of what is normally a stronger material, teflon or polytetrafluoroethylene (PTFE, the same material used in Gore-Tex fabric). This type of floss typically glides better over the teeth surfaces, but can be harder to use in tight gaps as it is thicker. Your basic dental floss is often available with or without a wax coating. The benefit of the wax coating is that it helps the floss glide over the tooth surface and can make the process and use that bit easier. 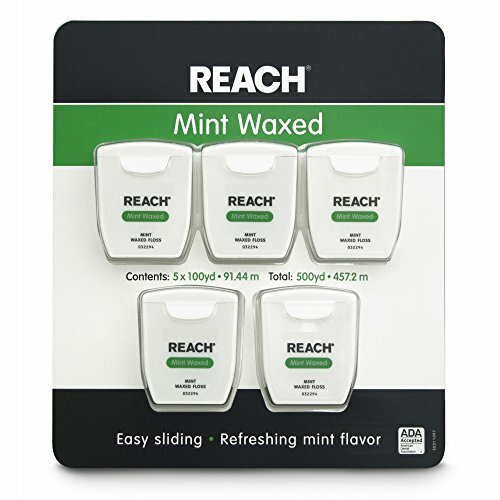 Sadly, by adding this wax coating impacts the thickness of the floss and means that for some unwaxed floss is better for use in the tightest of spaces in the mouth. The waxed floss tends to be stronger than the unwaxed, but more expensive as a result. The floss is normally sold on a reel that allow you to cut to length the floss as and when you need it. Dental tape is normally wide and flat rather than string floss that is thin and round. The tape gives a larger surface area as it passes over the tooth surface. When wrapped taught around the fingers, the tape can feel more pleasant than string, but this type of floss tends to suit those with larger gaps between their teeth. Therefore those with really tight gaps may find it simply does not suit their tooth positioning and spacing. Of course this is also available in waxed and unwaxed option. Tape can be useful when teaching children to floss as the larger surface area is easier for the young to handle and get to grips with. Normally sold on a reel, tens of feet long, you can cut a piece to your desired length each time you need it. 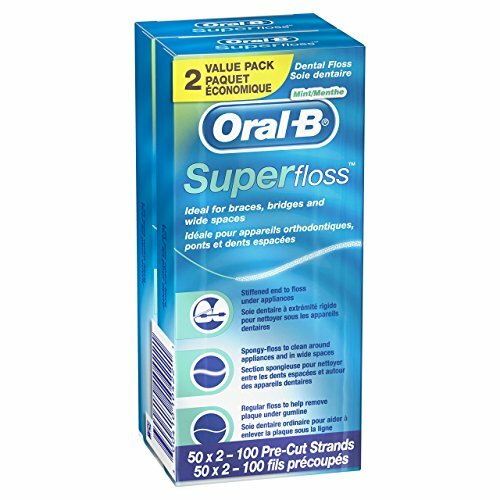 Designed with those who wear bridges and braces in mind, this floss is pre-cut before being packaged normally. Not supplied on a reel, you will typically pull a piece out of the box ready for use. Made up of 3 parts, the Superfloss has a stiff, spongy and regular floss section to it. Because flossing around such dental appliances can be tricky, the stiff section acts a little like a guide wire. It does not bend or flex in the same way as the floss does, meaning it can be fed through gaps or spaces with more ease and accuracy. Once through the gap you intend to clean, the spongy and regular floss follow behind to make contact with the areas that need cleaning. This type of floss also works well for children and those with poor manual dexterity. If you struggle gripping normal floss, or reaching your fingers into your mouth, then flossettes might just be for you! With flossettes, the floss is pre-cut and pulled between plastic. You can grip the handle to pull the floss between the teeth. TePe Mini-flossers are an example of these, and they have made a handy video showing you how to use them here. Flossing might be a vital part of keeping your mouth healthy, but many more of us are becoming aware of the impact on the environment and society we are having by using these man-made products. There are now an increasing number of natural options available that are not made from any chemicals or artificial waxes. Natural ingredients and essential oils are used instead to mimic the results achieved by the more common alternatives. It might well be more of a psychological affect more than anything, but most would probably agree that their mouth feels fresher and they feel better if there is a taste, mint comes to mind. Through years of using mint flavoured products many of us have associated this flavor to mean clean and fresh when in reality we don’t need to have a flavor for our mouths to be clean. More of the natural products run with this, not choosing to scent their products. These remain a little more niche and the big brand products now produce ever increasing flavors of floss, to get you and I more encouraged to do so and ultimately keep buying their products. The exact approach you take to floss your teeth can vary slightly depending on the type of flossing product used and the size of the gaps between teeth. Step 2: Wrap the ends around your two index fingers, and stretch it between them, so it is fairly taught, leaving about 6 inches (15cm) between the two fingers. Step 3: Gently position the floss in between teeth, flex the floss slightly so it cups around the edge of one tooth in an C like shape. Move the floss up and down to get rid of plaque. Repeat this for the tooth on the other side of that same gap. Step 4: Repeat this for the tooth on the other side of that same gap. Step 5: Repeat this process for all teeth and gaps in the mouth. Step 6: Dispose of the floss. The following video gives a good representation on how to floss. As I said earlier in the article, there is no one floss or flossing product that is right for everyone. We are all unique in the shape and profile of the mouth. You need to find the tools that work best for you. If you are not sure what tools are right for you, then ask your dentist or hygienist, they will more than happily give their professional opinion on what type of product you should be using and why. A dental professional has tools they can use to measure the gaps between teeth and give you very specific recommendations. Many will too have samples in the office that you can try, so that you can yourself actually know what the differences are by seeing and using them. Floss is just one product within a wider range, suitable for cleaning interdental spaces. It is however the default tool as in most cases it is one of the most effective as it works for most people and is relatively cheap to buy too. I explain some of the other types of tools that can help with cleaning in between the teeth shortly. If you don’t see your dentist for their advice on what is right for you, then it will likely be a process of trial and error until you find what works best for you. 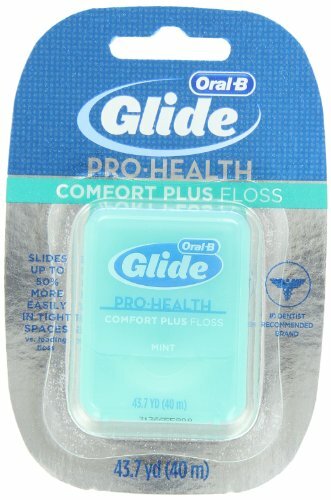 I made a list of points earlier with reasons why you might not want to floss. These are the drawbacks and real reasons so many of us choose to skip what should be a daily exercise. Even if you have the intention of flossing and are willing to learn, some of these drawbacks can still put you off. I wanted to address some of these drawbacks, because whilst many are valid, they can be overcome very simply. Yes, it can be. It will take time and practice to master the technique and for some it will come easier than others. If you can’t get to grips with it or find it awkward, then consider testing out other interdental cleaning tools such as interdental brushes or water flossers that might be easier and more effective for you. Yes, flossing does take time. Some options make it possible to speed up the flossing process and of course the more practice you have the quicker you become, but in the early days, it will take more time. However, just a few minutes a day can have a big impact on your oral health, your overall health and confidence too. If you have to suffer from painful sore gums for weeks on end that could potentially have been avoided had you flossed, you may feel differently about the time taken. Yes, you do need the right technique with flossing for it to be fully effective. However, any flossing or interdental cleaning is better than none, but if you are going to do it, you might as well do it right so that you can gain as much benefit from the time applied. The technique is not that difficult to master with a bit of practice. Speak to your dentist or hygienist and they will happily show you the best approach and give handy tips. There are conflicting opinions over the benefits of flossing, primarily because some studies have been deemed weak in their results. However, the general consensus amongst dental professionals is that flossing or interdental cleaning has and always will be important in maintaining oral health and assisting in the prevention of common health issues. More recent media attention has twisted recent medical findings and advice, suggesting that flossing may not be necessary. This is a common side effect of flossing for some. But it can stop with regular flossing. Generally, bleeding gums is a sign that your brushing and flossing routine is not up to standard. Healthy gums should not bleed regularly. Gums can bleed if bacteria is building up on the teeth and under the gumline. They become inflamed, red, puffy and sore to the touch and more susceptible to bleeding. If your gums do not stop bleeding after regular brushing and flossing for a couple of weeks, consult your dentist. This could be the early signs of gum disease. Another reason the gums may bleed is that you are too forceful with the floss and the gums become damaged or suffer trauma as a result of the flossing and therefore bleed. Being more gentle can help. If you get a lot of bleeding or are concerned, always seek professional advice. Linked with the bleeding in some respect flossing can hurt, particularly if you are suffering with inflammation of the gums. However, it could also be a sign that you are not flossing correctly or are using the wrong tools. In a normal healthy mouth, flossing should not hurt. The dental floss should glide comfortably down the side of the tooth and into the gumline. If you are in pain check your technique, floss more gently or try different tools. This is indeed true and it is for this reason you should try different products and speak to your dental professional to get the most appropriate advice for you, your mouth and teeth. Whilst this article is focused on the best dental floss it is important for you to know that there are a number of different tools that an help you with flossing. Some make better use of traditional floss, whilst others bring a new approach to flossing. This type of tool takes away some of the awkwardness of flossing. If you feel you are all fingers and thumbs when flossing, the 2 arms that hold a piece of floss taught can be a much more convenient option. Those who get greatest benefit from these types of products are those with limited dexterity and those who simply find the normal flossing process difficult. Often called flossing harps because a piece of floss or dental tape is held between 2 arms and when viewed side on, has a similar look to the musical instrument, the harp. There is a handle that offers up height to the tool and allows you to more easily move the floss in between teeth and different areas of the mouth. It is quite normal for the other end of the floss pick’s handle to have a pointed end to it, to act as a toothpick, hence the ‘pick’ part of the name. Normally made of plastic, the picks are sold typically in larger packets containing tens, if not hundreds of them, because they are designed for one time use. With a similar design to the floss picks mentioned above, the key difference is that rather than being pre-fitted out of the packet with floss, you place a piece of floss into the holder. The holder is therefore reusable and it is the bit of floss that is replaced each time. A little more environmentally friendly, it gives the benefit of the added manoeuvrability and reach into the mouth. Part of the manoeuvrability comes from the length/height of the floss holder. The longer it is the more reach it gives and reduces the need for fingers to be placed in the mouth. Some manufacturers have produced products that are somewhat of a crossover between the floss pick and floss holder. Long toothbrush like handles, make way for interchangeable heads, that are replaced each time you floss. For some this is a faster and more convenient option. Doing just what the name implies, these are very simple, yet ingenious tools that help place and move the dental floss into certain positions in the mouth. Desired and used most frequently by wearers of dental bridges or braces, the floss is looped through the threaders and pulled through a gap. It is much like a piece of thread being fed through the eye of a needle and then pushed through a piece of fabric. The threader is stiffer than the floss, but has enough flex to allow floss to be passed in between and through brace wires etc. You might know interdental brushes better if I say the brand name TePe. This Swedish company have been in many respects the pioneers within this market since their introduction in the 1980’s. Think of them like a miniaturised bottle brush, a number of bristles are woven into a shaft that allows for the brush to be fed through interdental spaces. 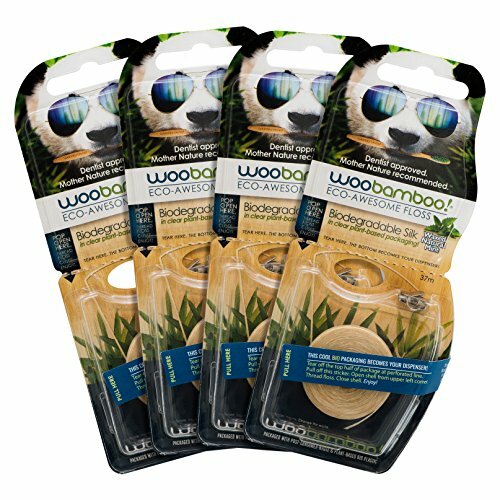 A more modern twist on dental floss, they have become the recommendation of many dental professionals globally as they combine interdental cleaning performance with convenience and have perhaps been one of, if not the most popular tool to get people taking more care of their teeth and perfect that flossing habit. Offering a 360 degree clean, manufacturers make brushes of different thicknesses, making them suitable for some of the smallest and largest gaps commonly found within the teeth. These varying sizes allow the user to use a brush that will fit into and make contact with all surfaces of that interdental space, dislodging particles and lifting bacteria such as plaque. I have put together a comprehensive guide together, that tells you all you need to know about the best interdental brushes and how to use them. A high tech approach to flossing, this makes use of a motor powered by a battery to move a piece of floss or floss pick in between the teeth. Oral-B manufactured the hugely popular Hummingbird, which offered both these options. This has however now been discontinued and it is now Waterpik’s Power Flosser is the best example of such a product today. Tools like this are fantastic if you really are never going to be able to get to grips with traditional flossing and really want an easier way to try and break habits you may have had for a lifetime. The floss/pick is a piece of soft rubber that essentially wiggles between the interdental space. Moving thousands of times per minute, the rubber flosser makes regular contact with the teeth and gum surfaces to remove debris and lift plaque. Replacing the dental floss and tape for powerful jets of water, water flossers have been developed by many companies, but it is the American firm Waterpik who have been pioneers within this space. They now offer both countertop and cordless water flossers. The idea is that the small water particles are pushed out at force onto the teeth, gums and they can evey reach under the gumline. The pressure and contact of the water molecules disrupt the sticky plaque and clean these interdental spaces. Naturally questions have been raised over their effectiveness, but Waterpik have invested heavily and many studies and dental professionals have endorsed them as effective products. A 2011 study found that a water flosser was twice as effective at reducing bleeding gums than dental floss and another study from 2009 found that a 3 second treatment on an area will remove 99.9% of plaque biofilm. Water flossers are more expensive to buy than floss, but this extra expense for some is well worth it based on the convenience such products bring. Different tips are provided to aid different users, including those with periodnotal pockets and those who wear braces. These tips do need replacing every 3-6 months adding to the ownership cost. Most models have variable pressure controls, so that a user can find the best setting for them. Why not check out our articles that look at the best electric water flossers to learn a little more. As mentioned earlier, leading bodies like the ADA and the NHS still advise flossing or interdental cleaning or some form. Whether you use floss, interdental brushes or even a water flosser, the choice is yours. Clinical studies and reviews have resulted in differing opinions on its effectiveness to remove plaque and help to overall better health, but despite some potentially weak evidence in most instances the advice is still to carry out this exercise. In 2008 Terexhalmy et al confirmed the benefits of flossing but did not find and clinically significant differences between the types of floss used. This means, whilst the super expensive fancy floss may look and taste good, it will unlikely bring you any noticeably better plaque or oral health benefits. In 2011, a review of a number of previously conducted trials concluded that brushing teeth and flossing, does reduce gingivitis (gum disease) compared to brushing teeth and not flossing. But, in this review, researchers found that some evidence was weak, particularly those that looked at flossing and the effectiveness of plaque removal. Newer studies in 2017, by Lee et al in Korea and Graziani, concludes that dental flossing or interdental cleaning should be conducted at least once a day to promote oral health and does remove more plaque than brushing alone. Here are a few quotes from practicing dentists. Everything we eat and drink has the potential to feed the bacteria in our mouths. Whilst tooth brushing will remove a lot of the debris and the bacteria, interdental cleaning is also important to reach the gaps that toothbrushing can’t. For most people (who don’t have severe gum disease) flossing is the most affordable and easiest option for doing this. – Dr Gemma Wheeler, in house dentist. The following are popular dental flosses available today that you may wish to consider in your plight to find the right tools and floss for you. This smooth, strong and shred resistant floss has earned the American Dental Associations approval and is one of the most popular and best selling reels on the market today. 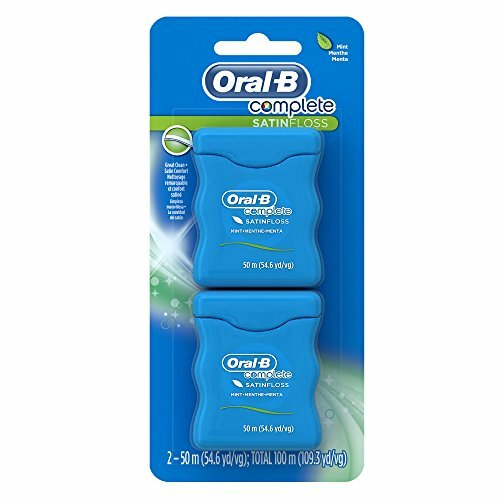 Oral-B actually guarantee the comfort when using this floss, that has been coated in a natural wax for better grip. Designed to gently stimulate the gums as it passes under the gumline, the floss lifts plaque and debris whilst leaving behind a minty freshness. 43.7 yards (40 meters) of floss is provided on each reel. With a fantastic 100 yards of floss on each reel, this mint waxed floss will last your for many weeks before needing to be replenished. In fact each reel will last over 6 months, if you use the suggested 18 inches of dental floss per day. Compared to the non waxed version, this floss is capable of removing up to 52% more plaque, which is the sort of data you want to hear, the whole point of flossing is to remove the plaque. Johnson & Johnson have made the floss to be strong so it resists shredding, which is all to common amongst many cheap dental flosses. ADA approved, it has been given the seal of acceptance having passed the strict criteria set by the countries leading dental association. Each reel of this dental floss offers 54.6 yards (50 meters), meaning enough floss to last you about 100 or so days. The satin-like texture helps the floss glide between teeth and below the gumline to remove the bacteria and plaque it comes into contact with. Mint if the flavor of choice, for a freshness release with each pass of the floss. This is an American Dental Associate approved floss. One of the most highly regarded products of its type each pack contains 50 pre-cut strands to allow you to floss effectively around braces, bridges and wide spaces. The stiffened end makes it easy to thread the floss, whilst the spongy floss effectively reaches in and around large gaps for effective cleaning. A length of regular floss allows for reach and fitting into smaller gaps that require attention. Those with braces, bridges, implants and other dental appliances can rejoice at the ease with with Proxysoft make flossing. Each box contains 30 strands of pre-cut floss. A floss threader makes the positioning of the floss easy and then allows for the remainder of the strand is made up of spongy filament to be pulled through the dental appliance. Offering up to 6 times more cleaning surface than brushes, the spongy material compresses and expands as it passes through and round dental appliances and interdental spaces. Each stand measures 10 inches in length. 32 yards (30 meters) of floss of spearmint flavoured flossing ribbon is provided per pack. A sustainable, and considerate product, Toms of Maine do not test on animals, use any artificial colors, flavors or fragrance with and strive to be environmentally conscious as possible. The nylon filament floss is thin and flat and should glide easily between teeth and along the gumline and help you keep your mouth fresh and clean. This is an American Dental Association approved product. 40 yards (37 meters) of this natural and biodegradeable silk floss is provided on each reel. Coated in natural beeswax, the silk floss glides over the teeth with ease. The floss has a mint flavour to it for that freshness we know and love with oral hygiene products. The plant based packaging doubles up as the dispenser to minimise the need for extra packaging. 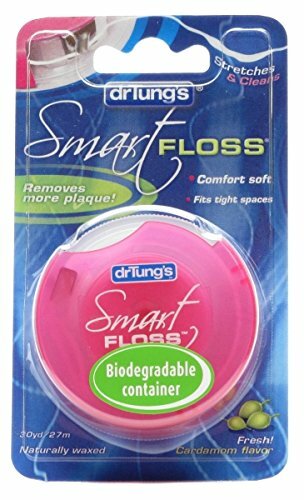 No stranger to oral healthcare products, Dr Tung makes one of our favourite tongue cleaners and this multifilament floss is a great complimentary product. Made from a fibre that is similar to cotton, it is coated in a blend of vegetable and beeswax for a smooth flossing experience. Cut a piece of floss and keep hold of it tight to fit into the smallest of spaces. Release the grip a little to allow the floss to stretch out. It actually expends, to fill the interdental space and achieve the best coverage it can with each pass through gaps in the mouth. As you might expect of a natural product, it comes in biodegradable packaging too. There is a lot of information to take in, so here is a summary and a number of helpful tips for you. Whilst it can at first appear to be as simple as picking up the most basic and cheapest of dental floss and just doing it, in reality it is not that simple. Key to the success of flossing is the right product for you, the right technique and daily repetition. To achieve all of this takes a little time and effort, but long term this is all worth it when you can have pink, healthy, blood free gums along with the confidence in knowing you are reducing your risk of other dental health issues. This article has provided a lot of information and will help you on your journey to better flossing and oral health. I myself am far from perfect at flossing, but I have gone through the process of trialling different products to find what works. Hopefully you will find this article useful and some of the suggested products will suit you and your needs. It depends on the brand and type of floss, so check the container/packaging. If the product does expire, avoid using after this time. Often the expiry date is a long time in the future, giving you many months between purchase and the time it must be used by. If you like to bulk buy, in many instances you can do this without fear of it being out of date, but do double check. Biodegradable products in particular are more likely to have an expiration date as after this time the strength, tase and general use may be compromised. Waxed v unwaxed floss – which is best? It is personal opinion and based on personal circumstances. Unwaxed floss can often reach or fit in tighter gaps, is cheaper and just as effective. The waxed floss on the other hand may be more enjoyable to use and work better for some. Find what works for you. A dentist would generally suggest that tape is better suited to those with wider gaps or larger surface area to their teeth. The flatter profile of tape can be more enjoyable to use for some as it often glides with more ease, is easier to hold compared to string floss. Standard floss is better suited to the ‘normal’ mouth with narrow spacing. Neither is more effective than the other in plaque removal. The opinion of many dental professionals is that the act of flossing with string or tape rather than water is more effective because the tape is making physical contact whereas water flossers rely on pressure and flow to dislodge and remove bacteria. However studies have shown water flossing to be effective. There are pros and cons for each but in many instances your dentist will be happy for you to use a water flosser if it means you will floss more regularly. Water flossers can be particularly helpful for those with limited dexterity, making the process easier. It’s best to speak to your dentist or dental professional for advice based on your circumstances.